Natural gas is the cleanest of the fossil fuels, with substantially lower emissions of nitrous oxide, sulfur dioxide, and carbon dioxide. With its positive environmental profile, gas has been the "fuel of choice" for power generation in the Northeast. Natural gas can also play a positive role in reducing transportation and building sector emissions. The natural gas industry is striving to reduce its environmental impacts, through such cooperative efforts as the U.S. EPA's "Natural Gas STAR" program. Natural gas production-including shale gas development-can be conducted in an environmentally sensitive manner, and yield environmental benefits to society. 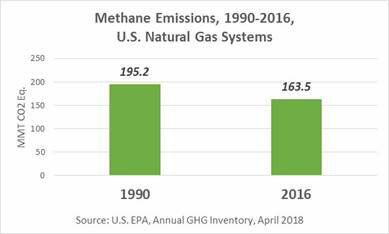 Methane emissions have declined in the U.S. over the last 2 decades, thanks to industry efforts and line replacements to repair leaks. Reducing methane emissions going forward is a common government and industry goal. Natural gas is a low carbon fuel, and is seen as a key element in U.S. efforts to transform its energy system to be more efficient and environmentally positive. Natural gas has been the "fuel of choice" for power generation in the Northeast for the last decade in large part because of its positive impacts on air quality and the environment; and it is also seen as a positive environmental fuel for transportation and other sectors. A review of some environmental trends regarding natural gas is provided in this summary. Natural gas is composed primarily of methane. As described by U.S. EPA: "Natural gas is a fossil fuel formed when layers of buried plants and animals are exposed to intense heat and pressure over thousands of years. The energy that the plants and animals originally obtained from the sun is stored in the form of carbon in natural gas." Natural gas has far fewer emissions of sulfur, nitrogen and carbon than other fossil fuels such as coal and oil. For instance, compared to coal, natural gas produces half as much carbon dioxide, less than a third as much nitrogen oxides, and virtually no sulfur oxides at the power plant. Natural gas has been the dominant fuel for new power generation in the Northeast and nationally for over a decade, and one of the leading reasons has been its beneficial impact on air emissions. The U.S. EPA has noted that, "because of their relatively high efficiency and reliance on natural gas as the primary fuel, gas turbines emit substantially less carbon dioxide (CO2) per kilowatt-hour (kWh) generated than any other fossil technology in general commercial use." 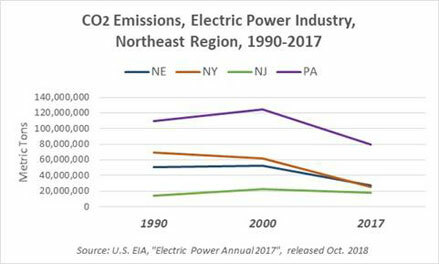 The electric utility sector in the Northeast has achieved major reductions in several air emission areas over the last 20 years-in great part thanks to new, more efficient power sources, from natural gas to renewables. For example, in New York State, from 2000 to 2016, NY ISO reports that emissions rates from the power sector dropped by 43% for CO2, 87% for NOx, and 98% for SO2. ISO-NE reports that from 2001 to 2017, total emissions from power plants in New England dropped by 98% for sulfur dioxide (SO2), 74% for nitrogen oxides (NOx), and 34% for CO2. The chart below shows changes in carbon emissions by the electric power industry in the region, for the years 1990, 2000 and 2017, as an example of the progress that has been made in the region in reducing emissions. Compressed natural gas (CNG) vehicles provide environmental benefits, reliability, cost-effectiveness, and are sourced from domestic supplies. ACEEE rated the CNG vehicle as one of the top 10 "greenest vehicles" on the road. And in October 2009, the National Research Council, affiliated with the National Academies of Science, released a report which observed that "compressed natural gas had lower damages than other options, as the technology's operation and fuel produce very few emissions." MIT's natural gas study of June 2011 stated that using very efficient natural gas powerplants to replace coal-fired plants is "the most cost-effective way of reducing CO2 emissions in the power sector" over the next 25 to 30 years. Natural gas will also play "a central role in integrating more intermittent renewable sources - wind and solar - into the electricity system because they can easily be brought in and out of service as needed." Continued investments in gas power generation will yield greater efficiencies and help the region meet its Clean Air-and energy-requirements. The natural gas vehicle (NGV), also known as CNG vehicles (for compressed natural gas), has many environmental advantages. NGVs remain a very competitive alternative to gasoline or diesel fuels, particularly for certain key markets such as fleets and urban bus systems. The U.S. Department of Energy's alternative fuel vehicle website notes: "Commercially available medium- and heavy-duty natural gas engines have demonstrated over 90% reductions of carbon monoxide (CO) and particulate matter, and more than 50% reduction in nitrogen oxides (NOx) relative to commercial diesel engines." Carbon dioxide (CO2) by 20 to 30% below those of diesel and gasoline vehicles. In October 2009, the National Research Council, affiliated with the National Academies of Science, released a report which noted that: "compressed natural gas had lower damages than other options, as the technology's operation and fuel produce very few emissions." The natural gas industry is cognizant of its responsibility to reduce emissions from its system operations. Many of NGA's distribution and transmission company members already participate in the U.S. EPA's "Natural Gas STAR" Program - progress continues on this front. For 2016 in the U.S., Natural Gas STAR partners reported methane emissions reduction of 51.4 Bcf, providing "cross-cutting benefits" according to EPA. Cumulative reductions since the year 2004 equal nearly 1 Tcf nationwide. For the distribution sector, as indicated above, the main emphasis has been on accelerating the replacement of older, more "leak-prone" pipe. EPA's 2017 GHG report indicates that methane emissions related to the nation's gas distribution system has declined by 73% since 1990 - indicating tremendous progress in that sector. Early in 2015, a national study led by Washington State University reported that direct measurement analysis showed "decreasing emissions from natural gas local distribution systems in the United States." Replacement of older pipe systems and improved leak surveys were among the reasons cited for the industry performance. A Harvard/BU study found higher estimates for methane emissions in the Boston area; while an ICF study for the Commonwealth of Massachusetts found that for the three geographic areas studied in the state, methane emissions fell within the range of 0.6 to 1.1% of all gas received. ICF noted that "the effectiveness of replacing cast iron and unprotected steel with plastic pipe to reduce emissions is clearly demonstrated in this study." Finally, an environmental issue of interest concerns the development of shale gas resources in the U.S. The MIT study on natural gas from June 2011 notes that "the environmental impacts of shale development are challenging but manageable." Industry and government regulatory agencies are working to address development in an environmentally safe manner. The Pennsylvania Department of Environmental Protection (DEP) in its 2017 Oil and Gas Annual Report released in August 2018, notes that: "Although there is no evidence that hydraulic fracturing has resulted in a direct impact to a water supply in Pennsylvania, there are cases where related oil and gas activities have adversely affected private water supplies. DEP investigates all stray gas-related complaints and if it is determined that a water supply is adversely affected by oil and gas activities, DEP works with the responsible operator to ensure the water supply is restored or replaced." DEP released a number of other relevant studies in 2018 related to natural gas production and the environment. In April 2018, PA DEP released the first four years of data on well structural soundness submitted by thousands of Pennsylvania oil and gas well operators. A comprehensive analysis of the first year, 2014, shows that the majority of wells in the state are being operated in a manner that greatly reduces the risk for groundwater impacts. The analysis "showed that less than 1 percent of operator observations indicated the types of integrity problems, such as gas outside surface casing, that could allow gas to move beyond the well footprint. The movement of gas or other fluids beyond a well footprint has the greatest potential to result in environmental concerns." 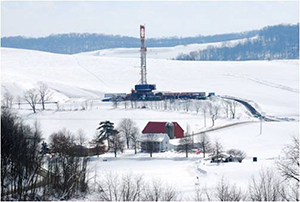 In July 2018, the DEP released a study on natural gas drilling and air emissions. The key findings of the study are that pollutants did not exceed regulatory standards. For example, "The primary criteria pollutant monitoring site, Meddings Road, did not report NAAQS-related values for any of the monitored criteria pollutants (e.g., Ozone, NO2, PM2.5, CO) which exceeded the applicable NAAQS or indicated a probable future exceedance based on the data pattern. In addition, the pattern of recorded pollutant concentration measurements did not indicate a localized source impact which would cause an exceedance of any of the NAAQS evaluated." The DEP also noted that "as unconventional natural gas extraction, gathering, and processing infrastructure develops to maturity, monitoring of criteria pollutants in the project area should continue." Other issues, such as reducing the use of diesel fuel in the production process, enhancing "green completion" in the entire production cycle to reduce emissions, and mitigating community impacts, continue to receive industry attention, in Pennsylvania and elsewhere. The industry must be responsible for best practices at all times.